The Chaser tops timeslot, Nine wins Wednesday. 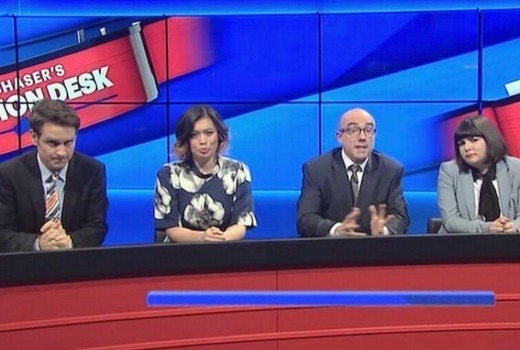 The debut by The Chaser’s Election Desk was a winner for ABC, scoring 783,000 and enough to top its timeslot. Shaun Micallef’s Mad as Hell also benefitted, with 726,000 as a season high. Meanwhile MasterChef was again strong for TEN, although notably The Hunt did well in a 4 city playout for Nine. Highway Patrol trailed the competition. Seven had better news with Seven News and Home and Away. Nine network won with 26.% then Seven 25.8%, TEN 22.5%, ABC 18.2% and SBS 6.9%. Nine News was best for Nine with 1.03m / 1.01m followed by A Current Affair (923,000), David Attenborough’s The Hunt (715,000 in 4 cities) and Hot Seat (575,000). The Footy Show was 202,000 in 2 cities, and Movie: Casino Royale was 190,000 in 3 cities. Matt and Kim to the Rescue in Perth averaged 92,000. Seven News was #1 with 1.13m / 1.11m for Seven then Home and Away (781,000), The Chase (656,000 / 399,000), Highway Patrol (594,000) and Criminal Minds (530,000 / 425,000). Blindspot was 146,000. MasterChef won its slot with 1.05m for TEN. The Project drew (656,000 / 496,000), Shark Tank was 625,000 and TEN Eyewitness News was 533,000. Hawaii Five-0 was 225,000. ABC News (808,000), The Chaser’s Election Desk (783,000), Shaun Micallef’s Mad as Hell (726,000), 7:30 (563,000), QI (505,000) and Would I Lie to You? (479,000) comprised ABC’s night. On SBS it was 24 Hours in Emergency (249,000), Armada: 12 Days to Save England (213,000), SBS World News (162,000) and Bosch (159,000). Ben and Holly’s Little Kingdom ruled multichannels with 275,000. Tags: 24 Hours in Emergency, 7:30, A Current Affair, ABC News, ABC News Breakfast, Armada: 12 Days to Save England, Ben and Holly's Little Kingdom, Blindspot, Bosch, Casino Royale, Criminal Minds, David Attenborough's The Hunt, Hawaii Five-0, Highway Patrol, Home and Away, Hot Seat, MasterChef Australia, Matt and Kim To The Rescue, Nine News, Qi, SBS World News, Seven News, Shark Tank, Shaun Micallef's Mad as Hell, Sunrise, TEN Eyewitness News, The Chase, The Chaser's Election Desk, The Footy Show, The Project, Today, Would I Lie To You? I thought the humour on Chaser was predictable and lame. It seemed like a job creation program for presenters from The Checkout. I watched Chaser last night and liked it although it felt weird having other people on the desk regularly chiming in, Instead of the core group we usually see. I assume some of them are from The Checkout which I don’t watch. Enjoyed The Chaser, they certainly do have the longest d**k. Mad As Hell was good too. “Too Cleverman By Half” said what a lot of people thought about it altho’ I’ll be watching again tonight. That’s my biggest night of Aus broadcast TV done for this week. All 2½ hours of it (3 if I count news in the background). Hadn’t watched the project in a while but I watched parts of it last night and thought it was good. I couldn’t believe that 1800 respect story. I’m no expert but it seems pretty obvious and logical that if a person has suffered and is distressed and calls for help they don’t want to have to be transferred, repeat themselves and have to build a rapport with someone else. Why add to their suffering?